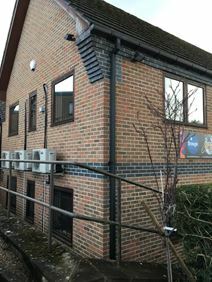 Office Space - Merrow, Surrey. Located on a Business Park, this space offers a great range of amenities including on-site parking spaces, a fully equipped kitchen, a management team and a number of meeting rooms. Less than 10 minutes away is the A43, providing road access into London, and there are a number of buses serving the area. In Guildford, the railway station has great connections, including frequent, fast services to London Waterloo.